Catherine was born in Fort Hall, Utah Territory in 1844 to Suzanne Cayuse and Mathieu Dauphin. Before settling in Frenchtown, her family moved from Utah to California to Oregon. On December 17, 1860, she married Amasa Piper (A.P.) Woodward (1834-1916) in Frenchtown. A.P. was born in Ohio, and lived in Illinois and then Iowa with his family before moving to the Walla Walla Valley in 1852. In the years before their marriage, A.P. served in various militias, fighting in Idaho and Fort Hall, and participating in the 1855 Battle of Walla Walla on the side of the Oregon Mounted Volunteers. He served in the regular Army from 1856 to 1858 as a messenger. A.P. left the army in 1858 and settled in Frenchtown. Catherine Dauphin and A.P. Woodward Family Photo. Catherine and A.P. 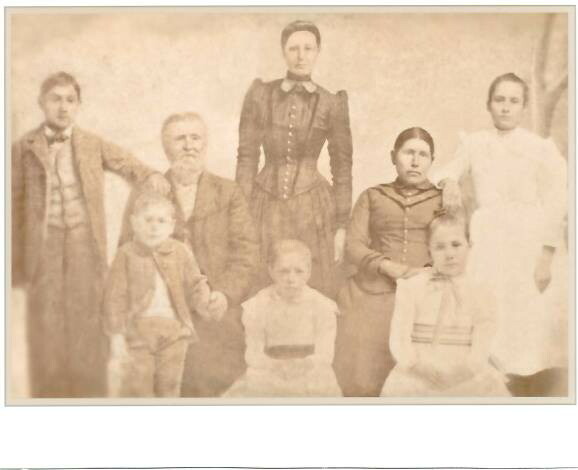 had seven children between 1862 and 1880. In 1883 they moved to the Umatilla Reservation, where Catherine, who was ½ Cayuse by her mother, and her children each received allotments. On June 16, 1888, after 28 years of marriage, Catherine and A.P. divorced. A.P. appears to have continued living on the reservation intermittently with his daughter Cora. He died on June 13, 1916 in a soldiers’ home in Roseburg, Oregon, and was buried in Mountain View Cemetery in Walla Walla. 1860 US Federal Census, Census Place: Walla Walla, Walla Walla, Washington; Roll: M653_1398; Page: 285; Image: 298; Family History Library Film: 805398. Munnick, Catholic Church Records of the Pacific Northwest, Walla Walla Register II, Frenchtown, St. Patricks and St. Rose of Lima, 1859-1872, Part II. P.6 M-3 Amos Woodward and Catherine Dauphin. 1850 US Federal Census, Census Place: Polk, Iowa; Roll: M432_188; Page: 20A; Image: 46. Elwood Evans, History of the Pacific Northwest Oregon and Washington; Embracing an Account of the Original Discoveries on the Pacific Coast of North America, and a Description of the Conquest, Settlement and Subjugation of the Original Territory of Oregon, Also Interesting Biographies of the Earliest Settlers and More Prominent Men and Women of the Pacific Northwest, including a Description of the Climate, Soil, Productions of Oregon and Washington, vol. 2, (Portland,: North Pacific History, 1889), 639. Evans, History of the Pacific Northwest, vol. 2, 639-40. Evans, History of the Pacific Northwest, vol. 2, 640. Early Oregonians Index, 1800-1860, entry for Woodward, Amasa Piper, accessed June 1, 2017 https://secure.sos.state.or.us/prs/profile.do?ancRecordNumber=98714. Death Certificate for Amasa P. Woodward, June 13, 1916, State Index No. 95, Local Registered No.66, Oregon Sate Board of Health, Bureau of Vital Statistics, on ancestry.com (http://mv.ancestry.com/viewer/b2806feb-30c2-434f-9bb2-663b168727d6/26191875/1797019633?_phsrc=tOF5&usePUBJs=true) shared by Judy Fortney, accessed July 30, 2016. The information in this paragraph comes from: Early Oregonians Index, 1800-1860, entry for Dauphin, Catherine, accessed June 1, 2017, https://secure.sos.state.or.us/prs/profile.do?ancRecordNumber=8630.